FRANKFURT (Reuters) -- Dutch mapmaker TomTom has deepened its partnership in high-definition mapping with German auto supplier Robert Bosch to refine the technology crucial for autonomous driving. As Nokia auctions its mapping service HERE, attracting interest from potential buyers including German carmakers, TomTom and Bosch said today that they would add new layers of data to their maps. "By the end of 2015 we want to have new high-precision maps for automated driving for all freeways and freeway-like roads in Germany," said Jan Maarten de Vries, TomTom's vice president of automotive operations. 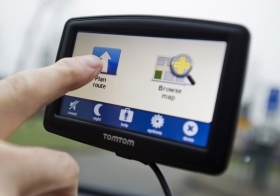 TomTom will design the maps while Bosch will help to define the required specifications. Road coverage will subsequently be extended to the rest of Europe and North America, Bosch said. Multi-layered high-definition maps are key to efforts to introduce automated driving on freeways from 2020, Bosch board member Dirk Hoheisel said. The new maps will contain a "localization layer" and a "planning layer" for cars to calculate their position on a road by comparing high-definition map data with that gathered by on-board sensors. Maps developed by TomTom and Bosch, a leading supplier of electronic and mechanical systems to the auto industry, are already being used in automated test vehicles in Germany and the U.S., albeit without any localization layer. Bosch's mobility solutions division is the largest business sector for Bosch Group, with 2014 sales of 33.3 billion euros ($36.2 billion), accounting for 68 percent of the group total. TomTom reported a fall in second-quarter net profit today. Its revenue figures showed it remains a tiny player in the autos market -- roughly a tenth the size of HERE, which counts most of the world's top 25 automakers as customers. It reported just 26 million euros in automotive revenue in the second quarter compared with the 261 million euros HERE generated from auto sales in the first quarter, the last period for which it posted results. TomTom's quarterly revenue rose 5 percent to 264.6 million euros ($287 million).